Fantastic for the outdoors, this rechargeable torch combines ergonomics, clever convenient technology, and high light quality you’ll love on safari, camping trips, and for hands-on tasks in low light. A rechargeable torch is one of the fundamental outdoor gear accessories - and the MT14 combines a range of features for extra convenience whether you're at home or in the woods. Being rechargeable, you're doing your bit for the environment - and your pocket - by not buying batteries. USB 3.0 technology means this torch charges makes for ultra quick charge times, giving you that added boost of power even with last-minute charges. Energy management is made easy with the battery and charge indicators. 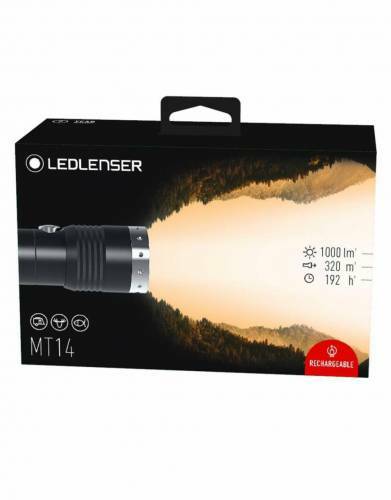 With Ledlenser superior light quality and technologies, the MT14 offers exceptional functionality. With four light functions, conserve battery life and choose the ideal light for tasks from reading to scanning the nighttime bush for animals on safari - and go through functions quickly and easily with full and half clicks of the button. 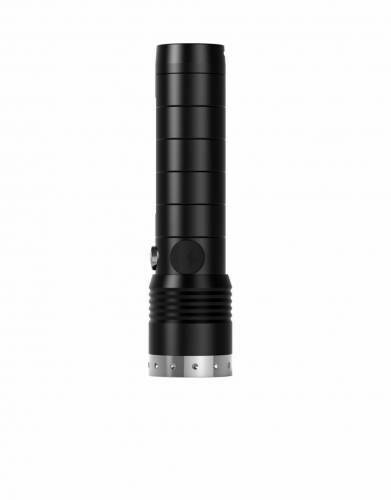 Combining power, light quality, and battery life, this torch is worthy of a place in your safari suitcase, toolbox, camp backpack, car, or top drawer at home for its quality and reliability. Range vs lumens: When buying torches, please do not only look at the lumens advertised, but also the range of the torch. Where Ledlenser is so impressive is that their torches are highly efficient at transforming battery power into light, which means that the range on a Ledlenser torch will often be much greater than the range on another make of LED torch, even when the other LED torch produces more lumens. As a leading international brand of hand-held torches and head lamps, Ledlenser is renowned for superior German engineering, outstanding performance, and state-of-the-art technologies such as the patented Advanced Focus System and Smart Light Technology. Constantly driving innovation to provide class-leading lighting instruments, Ledlenser is the brand of choice for professional tradesmen, emergency services personnel, search and rescue teams, and serious outdoor enthusiasts. Ledlenser hand torches and head lamps deliver breath-taking, bright, homogeneous white light that turns night into day and simply has to be seen to be believed. Using only the finest materials such as energy-efficient CREE LED light chips, aircraft-grade aluminium, and gold-plated contacts, they are renowned for quality and have a reputation for reliability that is second to none. Torch etiquette on safari: Please note that one should never shine a torch into the eyes of diurnal animals, including elephants. This may result in them becoming dazed, leaving them vulnerable to predators. 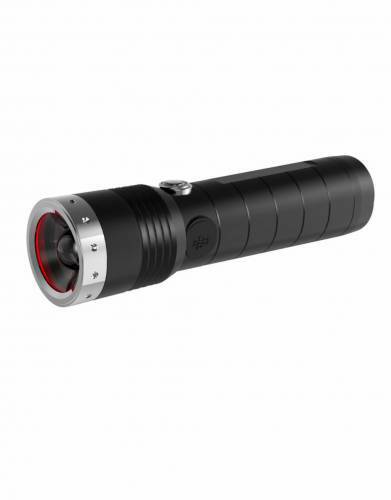 • Packing a high-quality torch is essential on all safaris. This is important for your safety at night. • Not only will a high-quality torch, such as the range we stock from Ledlenser, ensure that you avoid stepping on any reptiles, arachnids, or insects at night when walking back to your room or tent, but you are also able to spot and avoid wildlife which may have wandered into the camp area in the evenings, as most camps are unfenced. • Spotting wildlife is also good fun at night. Please ensure that you do so from a safe vantage point such as from the lodge or from the comfort of your room or tent. Your guide and lodge staff should be able to assist you in finding the safest position from which to view the animal. • For guidelines on which animals you should not shine on at night and for other useful torch usage information, please see the section on this page called "Torch etiquette". 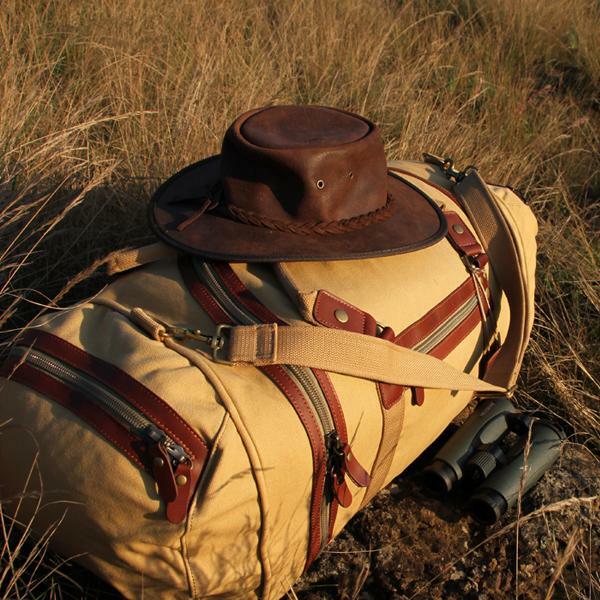 • Our expert, honest advice has the sole intention of increasing your enjoyment and safety whilst on safari and comes from years of experience on all types of safaris and adventures in Africa. • Natural behaviour: For all the activities you enjoy on your safari, please remember that the ultimate safari involves seeing natural behaviour from the animals you have travelled so far to spend time with. What we mean by this is that you and your guide should not confront any animal while on safari, but rather stay a safe distance away from the animal so that they continue with their habits as if you were not there. The holy grail of safaris is to use the wind, sun, and your guide's skills to try view the animal without it ever becoming aware of your presence. Watching an intimate moment between an elephant cow and calf beats an elephant charging you when you venture too close and she feels threatened. Please bear this in mind when viewing animals during the day and at night - no matter how great or small. Wildlife observations in an open, natural habitat are a privilege and leaving animals as undisturbed as possible by our encounters is what we should all strive to achieve. 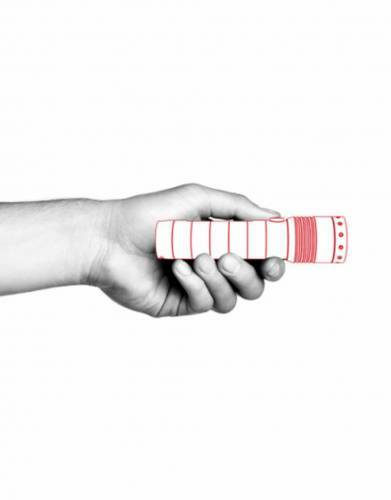 ⊙ WHAT'S IN THE BOX?